This is my mom Joan Lloyd (nee Anderson) and her cousin Kathleen Lane (nee Smith) in my mom’s grandparents garden at 7, Jordan Place, Bradley. This is my mom Joan Lloyd (nee Anderson) and her cousin Kathleen Lane (nee Smith) in my mom’s grandparents garden at 7, Jordan Place, Bradley. My mom is on the left and Kathleen on the right. This place was very important to my mom as she went there daily at lunchtime from primary school, as the school, St.Martin’s Primary was just 5 minutes away. This is my mom with friends at her 9th birthday party they are standing at the front of the bungalow she lived in, in Bradley. 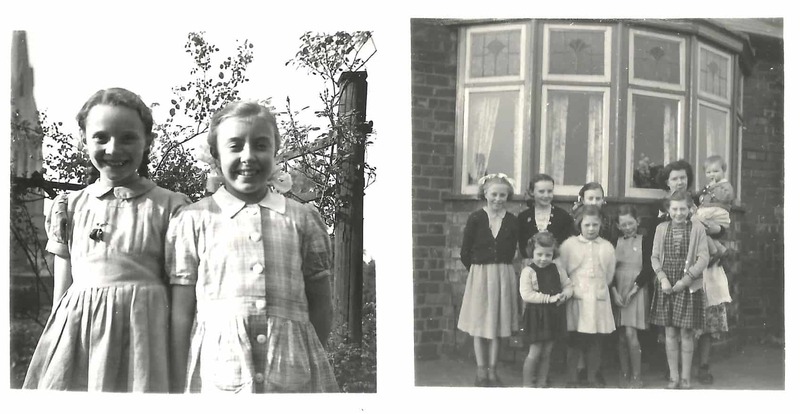 Pictured here are- back row – Mavis Jones, Joan Lloyd (nee Anderson), Kathleen Smith (nee Lane), Marjorie Anderson with Keith Anderson. Front row – Carolyn Titley, Pamela Titley, Carol Round and Valerie Lloyd.